Make no mistake, data center operators need all the help they can get these days. To compete and win in today’s supercharged global marketplace, companies must roll out new applications and services faster than ever before while maintaining round-the-clock availability and responsive performance amid exponentially increasing traffic. 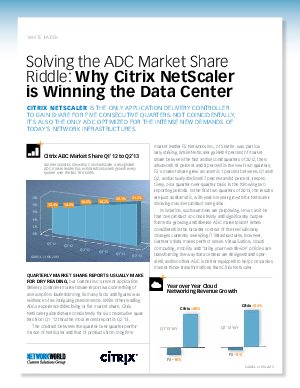 Learn how NetScaler, more than any other product out there, has kept pace with industry changes, and is winning the hearts and minds of IT leaders.